Note:This hand is now part of a huge collection of "Giant Hands Around The World". 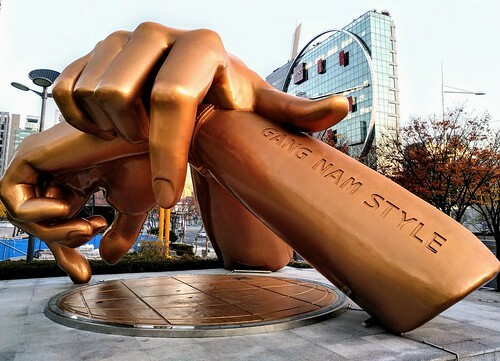 The collection contains 170+ hand sculptures..
Gangnam Style by South Korean musician Psy is one of the most popular song. It became the first YouTube video to reach one billion views and has reached 3.2 billion views so far. The video was shot at the eastern gate of the Coex Mall in Gangnam District of Seoul. To honour the singer, a pair of giant golden hands sculpture has been erected near the spot where the video was filmed. Inaugurated on 15th April, 2016, the bronze statue is 5 meters high, 8 meters wide and shows two fists one above another, depicting the iconic horse-riding hand motion of the music video. Whenever someone approaches the sculpture, its built-in sensors turn on multi-coloured flashing lights and play the famous tune. The sculpture has become an iconic landmark of the city.